From the time we are toddlers, team work is stressed daily. From playing together in a play group to Little League and group projects in school, we are expected to be a team player. It doesn’t change when we become adults and enter the professional world either as an employee or a family business manager. Collaboration with other family members is what gets the family business started and helps it grow. This means working with others to complete a task and achieve shared goals. In fact, learning how to build a collaborative team environment is the goal of most family business managers. As that manager you need to communicate what is expected of each family member. Establishing collaboration is a necessity for the success of the family business. Each family member should know their role and responsibilities in the business. Everyone should know exactly what is required of them in their position. In a collaborative environment each family member is responsible for the family as a whole. Open communication between family members is essential. Miscommunication can undermine the businesses success by creating hard feelings. Each team member should strive to be understood and heard. If misunderstands occur they should be taken care of and cleared up quickly. The family team should have mutually agreed upon goals to work towards. These goals should be measurable and include a specific time table such as monthly or quarterly. With the entire team focused on these goals, each individual’s efforts will be aligned with the final outcome. Remember to re-evaluate the goals as necessary. The family business environment should be conducive to team members questioning and brainstorming systems and solutions without judgment. As a family business manager, nurture a can-do attitude among the members. Undoubtedly, each family member will bring his or her own strengths to the table. Leverage these inherent strengths by setting them up for success in their role in the business. Eliminate family business conflicts by building trust between all family members. Each team member should be honest and transparent in all their dealings with other family members. Even in a family business, members frequently come from diverse walks of life and, therefore, bring different perspectives and backgrounds to the business. One would think a family really knows the other family members but that is not always the case. You should encourage everyone to get to know others they may not now well such as your brother-in-law or even Aunt Sue. When brainstorming family business matters, each idea should be based on its own merits and not the individual bringing it to the table. All team members should know they can learn from each other and not make negative remarks about a person’s views, no matter how off the wall. 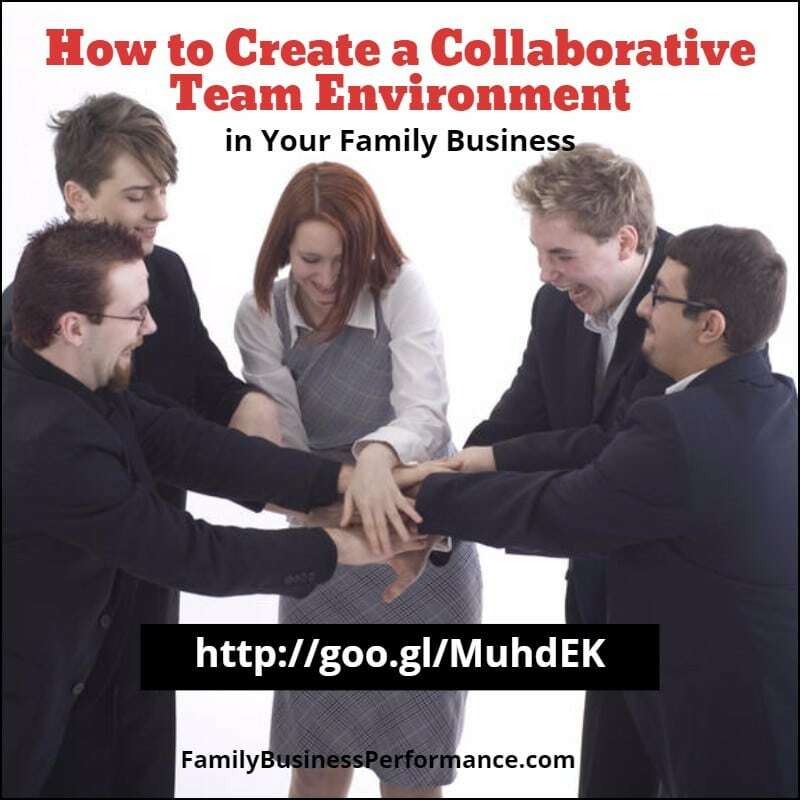 In the end each family business needs to know how to build a collaborative team environment. Family business managers are responsible for letting each family member know what their role is in the business and what is expected of them. With a positive, collaborative team the family business will run smoother and each family member will be happier with their role in the business. If you would like help creating a positive environment in your family business, check out the Family Business Performance Center’s coaching programs.